Hello, this is a short/easy tutorial that shows how I produced in 3dsmax the regions of my upcoming game Boïnihi, part of the Black Cube series. It is the same process that I used for my previous games ASA: A Space Adventure, Myha and Catyph, except that here I've added new tools in the workflow (particularly Sculptris, a free modeling software). Most of the tutorial will rely on videos in order to be more accurate (because my English is not always great!). First of all, you can watch the announcement teaser of the game. You will see several regions of Boïnihi, including Ailhon Woods (0:40) that I take as an example for my explanations in this article. Now that you see where I want to go, let's start from the beginning. Before I get to modeling and rendering the environment in 3D, I usually start with a quick sketching session. Since a few years I am using watercolor paintings as a way to gather ideas and see if they work properly. On my youtube channel, I post every Sunday a new video for my Patreon page (usually private videos, only for my patrons). Two weeks ago I shared with them the result of my Sunday Watercolor session, which was one of the sketches for Boïnihi. This region named Ailhon Woods was inspired by a French forest that I visited during my Summer holidays of 2016 in Ardèche. The place was beautiful and had kept many remains of the past (ruins, historic facts, etc), and I really enjoyed what I saw. However my game Boïnihi is in the Black Cube series, which is synonymous of Sci-Fi and other worlds, so it is also very inspired by various things that don't exist in reality, other planets and moons. Here in Ailhon Woods you can mainly feel the influence of Eastern countries (the whole game was very inspired by Japan, China, buddhism, etc), which explains the addition of a japanese bridge in these woods... This is now a totaly exotic place. Then, when the watercolor sketching is finished and that I am satisfied by the ideas, I go on with the 3D. You may know that I am not very at ease (yet) with full3D engines, and I am still using 2D engines such as Visionaire Studio, or more specifically in this case, Adventure Maker. Both of them require to work with prerendered 3D pics. Boïnihi will indeed feature 360° panoramic nodes in 2D (prerendered 3D) like in my previous game Myha (or some of the views in ASA). I start from a plane (a flat rectangle surface) where I add heights and details. 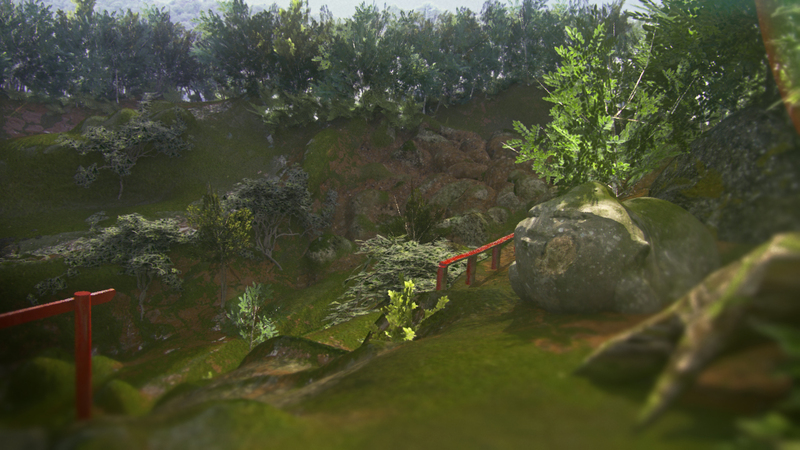 Thus the field is sculpted, I place stairs, rocks, stones, gaps and everything else I need. Then in a second stage I add the ground textures. I choose the most representative texture first (here it was grass everywhere), then I put more and more details, I paint them directly on the model, and I continue like that until I find it good looking. At the end of this stage, the field is ready to use, but the region is far from finished. I still have to add trees, buildings, shrubs, etc (all of which have to be created separately). Some time ago I had uploaded on my Youtube channel a video showing how I create the trees in 3D. These trees are different than the ones I made for Boïnihi, but it's still interesting to see the box modeling technique. I don't use pre-built assets from stores or existing libraries, I try to create everything I can for my games, even the trees, and even if the result is not as great as if I had used a beautiful realistic vegetation purchased online. This is, more or less, what you will see in the game, except that you'll be able to turn the view at 360°. Of course there will be much more: puzzles to solve, several varied regions to discover (Ailhon is not the only place! ), CG cutscenes (opening/ending animated films), a very good soundtrack by Yazorius, and a new story in the Black Cube series! I hope that you understand the global process (quite simple, no?) and that you'll be eager to discover the final result in the game. To create the game and this tutorial I used the following softwares: 3dsmax, After Effects, Photoshop, Sculptris, Adventure Maker and various plugins. I hope you liked this tutorial and that you'll be curious to discover Boïnihi when it will release in a few weeks. The game will be on itch.io for a budget (around $5 probably). You can also try my free game Myha, that was made in 10 days during the Myst Jam 2016, or discover my other SciFi Myst-like games ASA: A Space Adventure and Catyph, or one of the upcoming projects in Full3D created by friends of mine: RealMYHA and Blue Moon. These projects can be found here on Indie DB, or on the official website of the Black Cube series. Very useful tutorial! Great work!